In his most famous essay, “Ahab and Nemesis”, legendary journalist A.J. Liebling chronicled the classic encounter between Archie Moore, a technically adept and tactically brilliant ring general, and Rocky Marciano, an awkward but ultra-aggressive power-house. Initially, Moore used his craft and cunning to offset his foe’s single-minded belligerence and jump out to an early lead-even scoring an early knockdown in the process. But, as the bout progressed into the middle rounds, Marciano used his strength and a wide array of glancing, clubbing blows to wear “The Old Mongoose” down, before eventually bouncing Moore off the mat four time en route to a ninth-round stoppage. 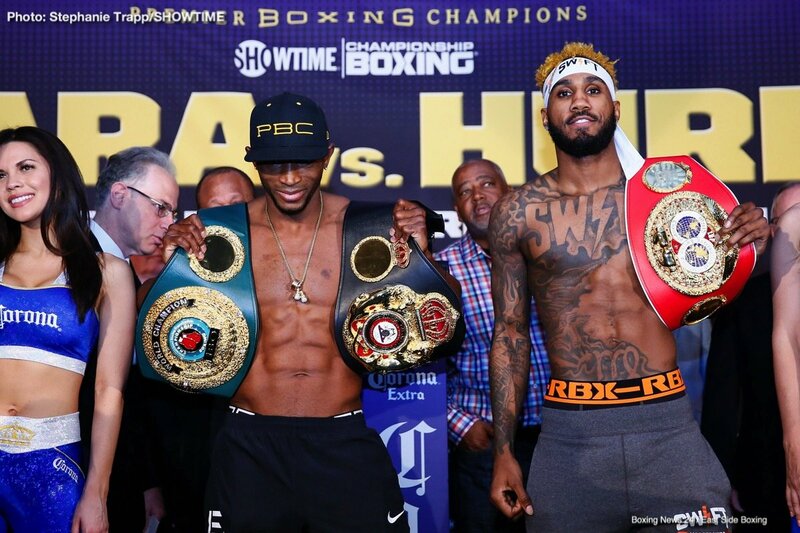 When I think about this evening’s junior middleweight unification bout between IBF kingpin Jarrett “Swift” Hurd (21-0, 15 KO’s) and his IBO and WBA Super World counterpart, Erislandy Lara (25-2-2, 14 KO’s), I can’t help but think that we might see something similar to what transpired when Moore played Ahab to the Rock’s Whale so many years earlier. In this particular remake, I think the Cuban-born and Houston-based Lara plays the same role that Archie once did. Like Moore, Lara hopes to use his pronounced edge in experience and technical superiority to overcome his younger opponent’s edge in terms of strength and power. To be fair to “The American Dream”, it’s easy to see why he’d be confident in his ability to do so. His punches tend to be quite a bit more compact and precise than his rival’s, his defense is far more efficient, and he rarely, if ever, leaves himself out of position for an opponent’s counter. In contrast, Hurd sometimes appears “gauche and inaccurate”, as Liebling would put it-especially in the early portion of the fight. In his previous two fights, he was out-boxed by a talented Tony Harrison, and also by former champion Austin Trout. That said, in both fights Hurd was able to maintain his composure, and find ways to target his opponent’s body. In each case, he was eventually able to shift his attack upstairs, while simultaneously making defensive adjustments to limit any of his opponent’s attempts at retaliation. This allowed Jarrett to lower the boom on Harrison in the ninth round of their fight, and then to bust up and overwhelm the older, but still viable, Trout in his next contest. Like Marciano, Hurd seems to have a knack for keeping his cool in the face of adversity, and for building upon any amount of success that he might enjoy. Those attributes should serve him well against an opponent who, in the past, has sometimes appeared a bit hypnotized by his own technical acumen and become a bit one-paced as a result. Moreover, Lara has sometimes seemed a bit uncomfortable when an opponent uses his aggression to make the fight messier and rougher than he would like; and there have been points where he’s been outright passive when opponent has taken it upon themselves to up their work-rate and take the fight directly to him. Tonight, Lara will face someone who-with the possible exception of the solid but unspectacular Vanes Matirosyan- possesses a greater willingness and ability to do just that than anyone he’s faced since he full recognition as WBA 154lb kingpin. He’ll also be facing someone who isn’t nearly as likely to become discouraged as other opponents like Ishe Smith, Delvin Rodriguez and Terrell Gausha have been when Lara jumps out to an early lead. Instead, he’ll be facing someone who will find a way to accelerate his attack as the fight progresses, gaining confidence every time he manages to make contact with his foe. At that point, Lara can either revert to form and simply coast along while being out-worked, out-hustled and eventually overtaken on the cards, or he can accelerate in turn in order to stem the tide and right the ship. Of course, if he chooses that approach, he puts himself into a situation where his larger and harder-punching opponent can land something big, and sink his dream to become a true superstar in the sport once and for all. There’s an old saying in boxing that “skills pay the bills”, and Erislandy Lara remains one of the most skill practitioners in the sport. But, all the skill in the world can’t prevent Nature from eventually finding a way to make its presence felt, especially when they haven’t really been put the test against meaningful opposition over the past three years. Jarrett Hurd may not be quite the force of nature that Marciano was in his day, but like a slow developing storm, he’s still capable of causing immense damage to anything, or anyone, that finds the misfortune of being in its path. Erislandy Lara is about to find himself in dangerous waters for the first time in quite a while tonight. And, like Ahab, I don’t see this version of Lara being able to successfully steer clear of the danger that’s heading directly toward him. The co-main event of Hurd-Lara features IBF 168lb champion, Minnesota’s Caleb Truax making his first defense against the man he defeated for the strap in a monumental upset, former British Olympic Gold medalist James DeGale. In their first fight, Truax was able to pin DeGale against the ropes for extended lengths of time and work him over to the body and head with both hands. Going into the rematch, DeGale would still have to be considered the superior technician, but his tendency to lay back and counter plays directly into Truax’s high-pressure,high-volume approach. Styles make fights, and I have to wonder if DeGale has it in him to change his style, and box exclusively from ring center at this stage in his career. He may be able to do so for a while, but at some point I suspect that Truax will replicate his feat of cornering his rival, and from that point forward will take control of the fight. Lightning sometimes can strike twice, and this, I think, is one of those times.